You are here: Home > MCSD News & Alerts > MCSD News & Alerts > District News > McKinley Cub Pack Invites Kindergarteners to Join Scouts! Monday, May 2nd! 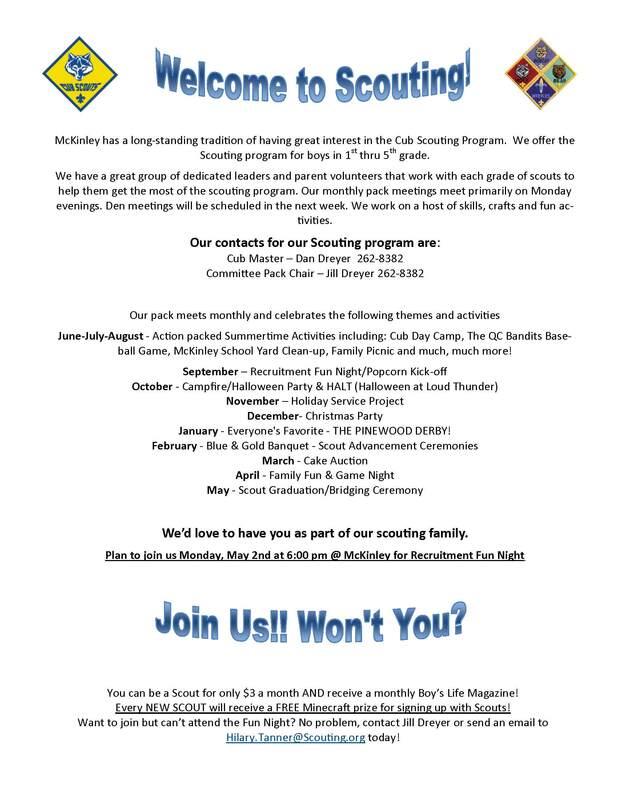 McKinley Cub Pack Invites Kindergarteners to Join Scouts! Monday, May 2nd! You Are Invited to Join the Adventure of Cub Scouts! All boys in kindergarten are invited to join the Cub Scouts for summer fun like hiking, fishing, camping, shooting bows & arrows and much more. Pack 114 of McKinley School wants to invite YOU to come to our Join Cub Scouts Event on Monday, May 2nd at 6:00 pm in the McKinley School Gym. For more information or with questions contact Jill Dreyer at (563) 262-8382.